Priya is a 12 year old girl. Her family of 3 school aged children are supported by their father, who farms vegetables and sells what he can to earn a living. Financial circumstances are very difficult. 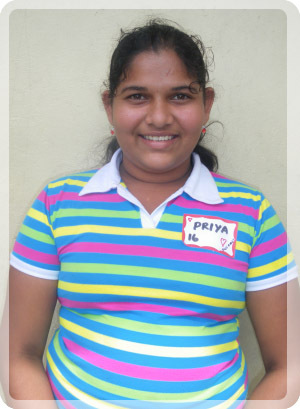 Priya enjoys attending school and her favourite subject is maths. When she is not at school she loves dancing, playing netball and reading story books. Priya travels to school each day walking on foot 2km each way. When she grows up, Priya wants to be a doctor. Priya is a very hardworking and obedient girl. She always participates in activities, and is motivated in learning. Priya is currently looking for a sponsor to continue schooling. You can ensure that Priya receives the education every child deserves.